That’s not a joke. 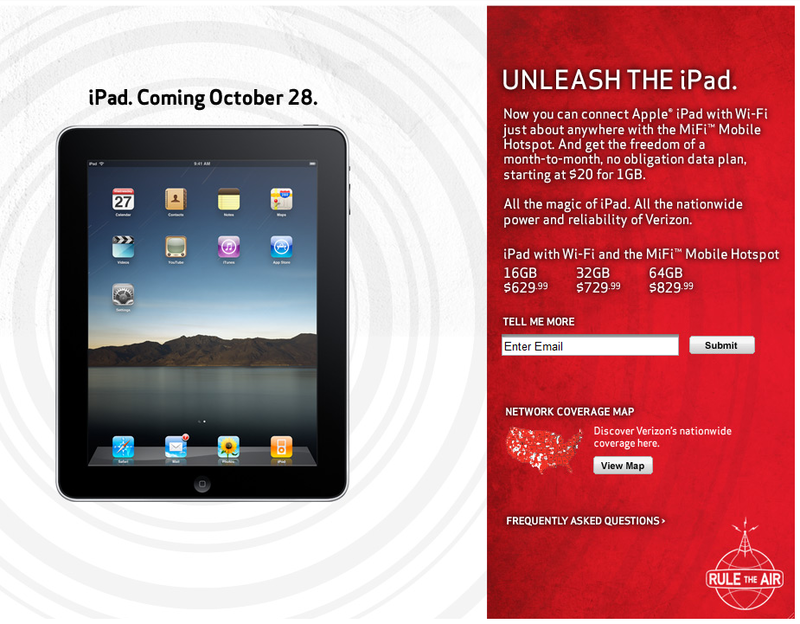 You can see Verizon’s teaser site for it right here. I guess, so much for the Galaxy Tab ever becoming a big seller? While I think anyone with any amount of brain matter can realize instantly that the Samsung Tab is by far the more superior device, it doesn’t have the name or release date yet to compete with the i*ad. Not really the start we were all hoping for from the Android tablet world. Let me just remind you that this is NOT a CDMA i*ad, so don’t start running around going “The i*hone is coming too!” Just wi-fi and MiFi here people. And yikes, holy pricing. Update: Now that I’ve actually been awake for more than 10 minutes, can I just say, “Who cares?” This really isn’t any different than someone walking into an Apple store, buying an i*ad and then walking back down to Verizon to purchase a MiFi unit separately. The only thing here is that you can do both in one store. And so everyone knows, you will apparently be able to do this in AT&T stores too. While it’s still annoying for the Android world that Verizon would do this 2-3 weeks before the release of the first major tablet, it really means nothing. Update 2: I understand that this means Verizon and Apple have formed a relationship and I guess I’m just not that surprised by it. The only thing that irks me about this is the timing just before the Galaxy Tab comes out.